Apple is requiring that all games for the new Apple TV be playable with the included Siri remote. Developers can’t require the use of a third-party Bluetooth controller. 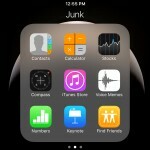 The news was first reported by TouchArcade after a tweet from developer Dustin Westphal. 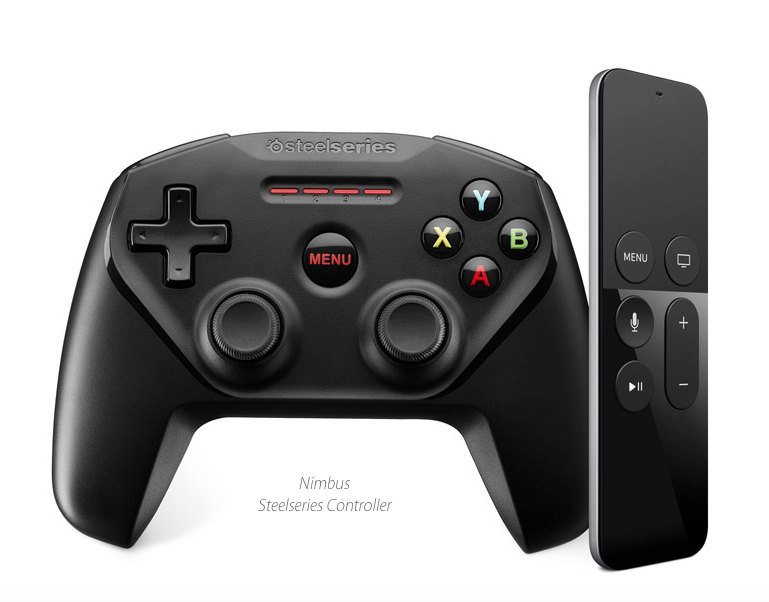 The Siri remote and a third-party controller from Nimbus. Interestingly, after the Apple TV was unveiled last week, the original wording indicated that Apple would allow developers to require a third-party controller. But I think Apple did the right thing by requiring games to be playable with its included remote. The last thing Apple wants is users to download and pay for a game that they can’t play without needing to make another expensive purchase. While it could hamper some developers, it’s best for the platform and users in the long-term. Griffin’s Survivor Play for the Siri remote will retail for $19.99. Speaking of the Apple TV, Griffin is the first accessory company to officially announce a case for the new device’s remote. 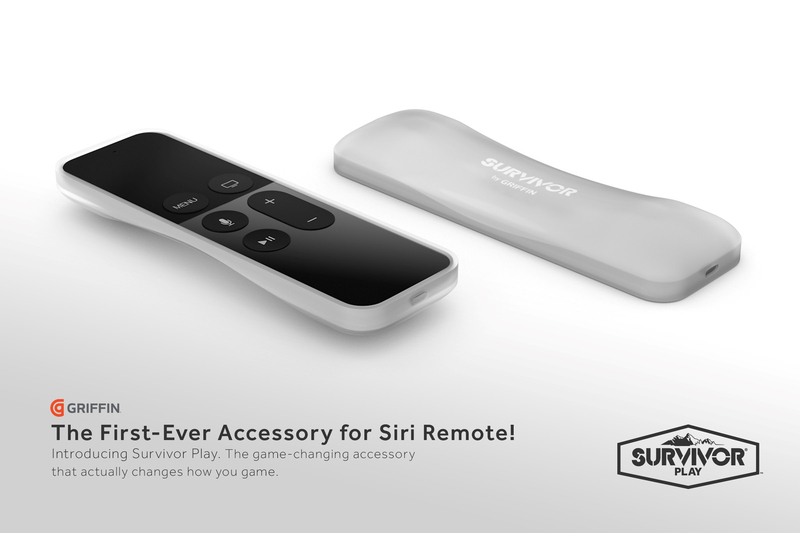 The Survivor Play wraps the Siri remote in non-slip silicone that protects the back and sides of the device from scratches and drops. It doesn’t cover any of the remote’s buttons or the touchscreen, microphone, or Lightning charging port. It will be available sometime this fall and retail for $19.99. To find out more information about the remote or sign up for availability update, visit Griffin’s site now. While I’m sure the remote will be just fine without a case, there will always be people who want to have that extra protection. And we still don’t know how much a replacement remote will cost either. Powered with a modern A8-series chip, the box also offers 2GB of RAM and features 802.11ac Wi-Fi and Bluetooth 4.2 support. 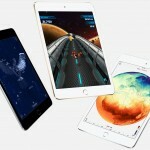 Apps, and especially games, are a major focus of the new device. Some of the games confirmed for the Apple TV include Guitar Hero Live, Crossy Road, and many others. Another great new feature is interactive notifications in TV apps. For example, while watching a game via MLB.com at Bat, live notifications will pop up on the screen showing other important information around the league. Just like previous generations of the device, you will also be able to view your photos and listen to music – including the Apple Music subscription service. There were will be two different versions available to purchase – a 32GB edition for $149 and a 64GB box for $199. The third-generation box will still be available for $69, but it won’t offer any of the new features. For other news today, see: Triber: a smart social app for connecting with friends and colleagues, Volley for iOS offers peer-to-peer advice for engineers, designers and more, Is your thumb green enough to win A Game of Onions?